Creating landing pages is easy, but you need to use Google Analytics to track landing page performance. In an earlier post, I wrote about creating landing pages for books. It is very easy, and another highly productive tool authors can use to promote their books. However, to know how well your landing pages are performing you need hard data. Unfortunately, tracking selected pages, such as landing pages on Google Analytics is not as easy as a one-click default report. If your landing pages are in a separate folder or have a common keyword, performing an advanced search in Analytics will find your pages and from there you can build a report or shortcut. But this is rarely the case, as landing pages usually have totally different page titles and URLs. This is especially so if you are A & B testing two similar pages with different URLs, keywords and page descriptions. If your pages have totally different URLs such as www.mysite/buy-my-book-on-amazon/, www.mysite/get-my-ebook-on-apple/, www.mysite/purchase-my-new-book-on-kobo/ and www.mysite/check-out-my-book-on-amazon/ there is no similarity. So to be able to group these pages together in one report is not possible with the standard search tool in Google Analytics. It took me over a week of searching, experimenting and failing before I finally found the answer. 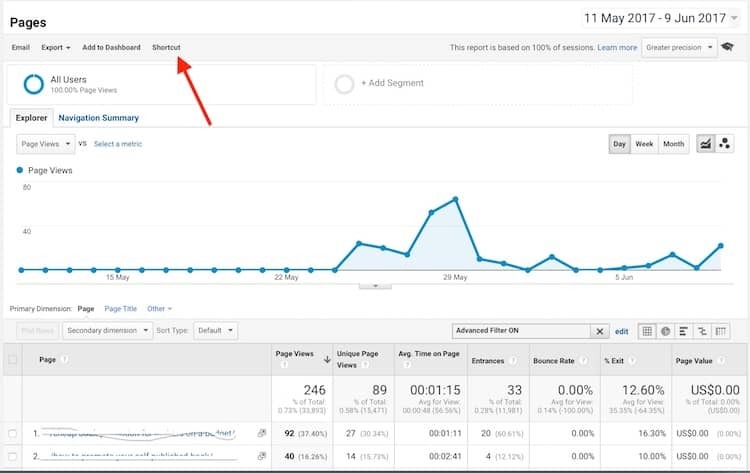 Yes, it is possible to create a search report in Google Analytics for random landing pages, which is exactly what you need have to be able to track your landing pages’ performance. So, here is how you can build a one-click custom landing page report in Google Analytics. Now remove your site root, backslashes and commas and separate each page with the pipe symbol. Notice that there is no space before and after each pipe. You may have to hunt to find the pipe (|) symbol on your keyboard. For me, it is alt+7 on a Mac. Now go to the search bar. Be sure to select Matching RegExp in the drop down box next to Pages, and then paste your pipe divided landing page list into the advanced search box. Click Apply, and you will have your selected pages report. Lastly, click Shortcut to name and save your report. Now you will have a one-click report in your Google Analytics customisation tab for all your selected landing pages. Landing pages are not listed on your website or menus. Think of them as stand-alone advertising pages that need to attract organic traffic to work for you. Some pages will work well, while others won’t. So it takes a process of trial and error to discover which pages, SEO titles, SEO page descriptions and content work the best for you. By using Google Analytics, you can check to see which of your landing pages are doing well and attracting page views and find the ones that need more work. Experimenting and a little determination are what is needed to get the best out of your landing pages to help with your book promotion. But with this simple report in Google Analytics, you have all the search data you need for your landing pages to succeed. Free Kindle Ebooks – Do They Generate Book Sales? If Google Analytics permits searching with regular expressions, then it might just be easier to direct people to one of the many sites online detailing how they’re used. The Wikipedia page provides a good enough introduction and there are plenty of guides online for various implementations of it.